News & Events | Musicians Foundation, Inc. 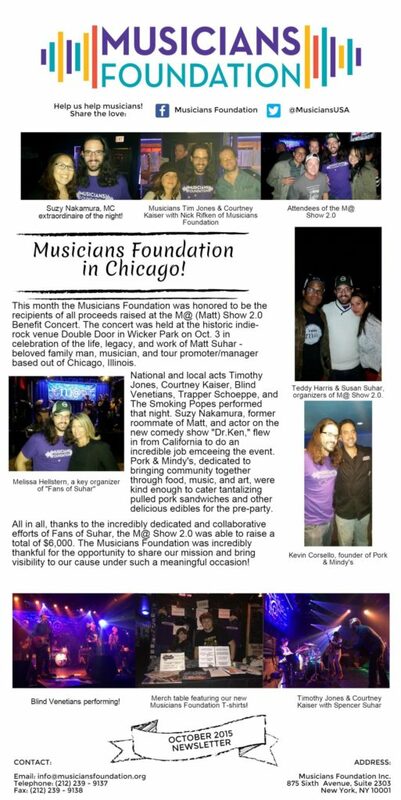 Important news, events, press and media entries relating to Musicians Foundation can all be found below. EVENT: The M@ Show 2.0 – A benefit concert of musicians helping musicians! We are honored to be chosen as the recipients for this year’s proceeds raised at the annual benefit concert The Matt Show 2.0 at the legendary indie rock venue Double Door this week on Saturday Oct 3rd 7:00 pm! The event is in celebration of the life of beloved Chicago musician, family man, tour-manager and promoter Matthew Suhar. 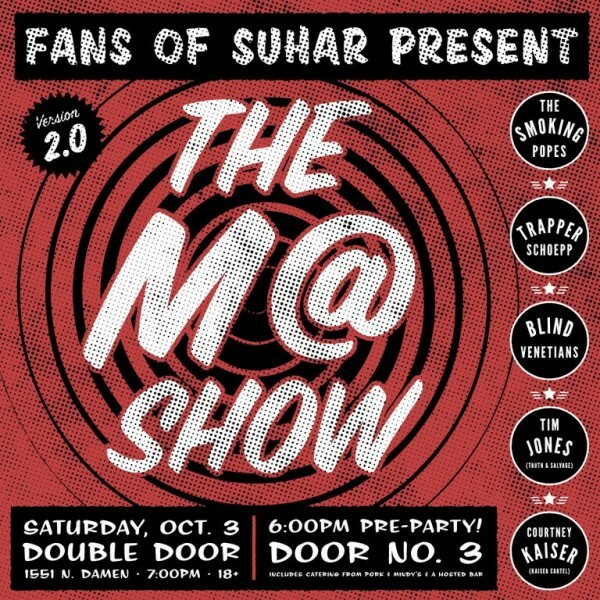 We are grateful for the bands providing music for the night: The Smoking Popes, Trapper Schoepp and The Shades, The Blind Venetians Reunion, Tim Jones, Courtney Kaiser, and friends as well as for the “Fans of Suhar” for organizing the event and Double Door for providing the venue space. How fitting for professional musicians to be helping professional musicians! We look forward to being there, to join in the celebration, and take part in the opportunity to share our cause. On behalf of the Board of Directors of the Musicians Foundation, we express our condolences and deepest sympathies to her extensive family. She served on the Board for over forty years with devotion and a deep sense of caring for the musicians who are our clients. She will be sorely missed. The NY Times published an article highlighting some of the wonderful work Ms. Stern did during her lifetime: http://nyti.ms/1OCOqTq. We are so excited to announce the upcoming Centennial Celebration event that Mildred Forrell and Bess Steiger will be hosting for us. Please stay tuned for pictures to come on our website! We celebrated a century of giving back to the people who make the music — our shared source of joy, inspiration and artistry on October 26th, 2014. 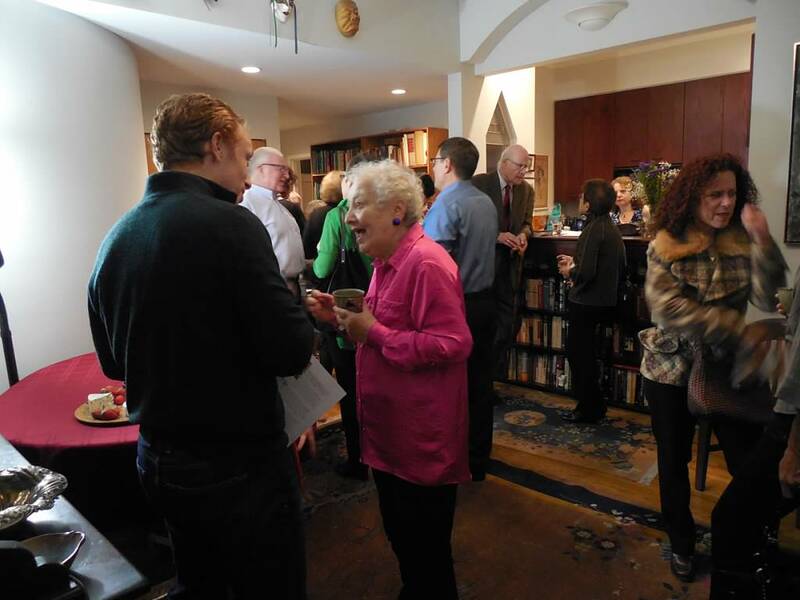 It was Hosted by Eleanor Korman, Patricia Paz & The Board of Directors of the Musicians Foundation. 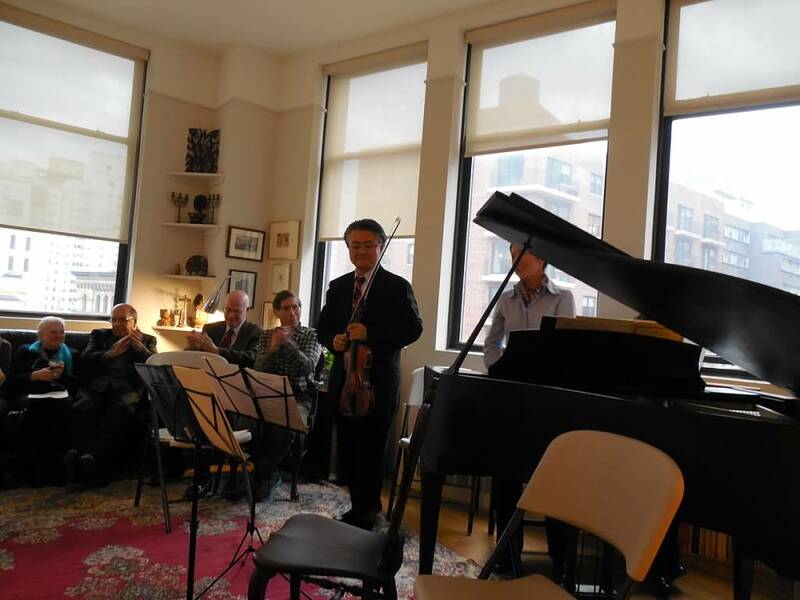 The Musical Program was performed by Michiyo Morikawa, piano; Nelly Rocha, cello; and Hisaichi Shimura, violin. Ms. Hara was born in Nagoya in Japan and began playing the piano at age three. She made her first stage appearance the following year. Her concert debut was with the Krakow State Philharmonic at the Aichi Prefectural Art Theater when she was ten. 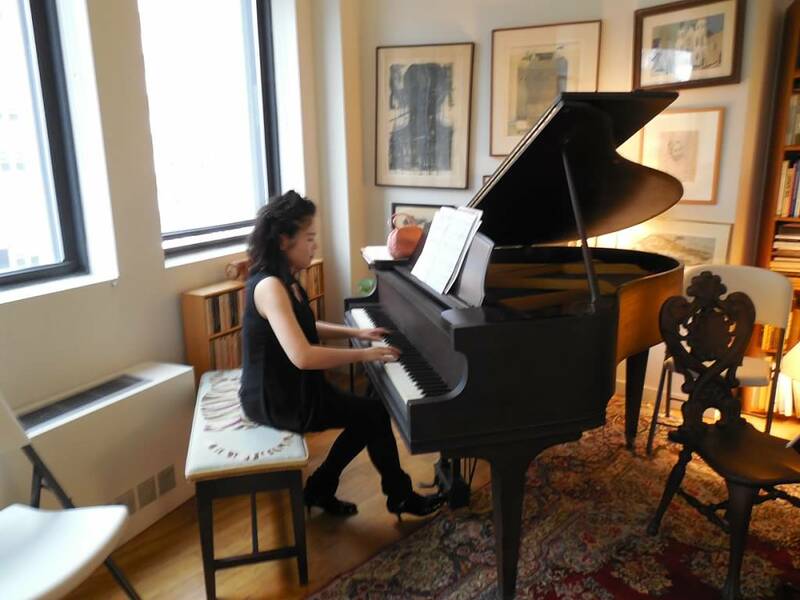 She graduated from the Toho conservatory high school and University and came to New York City to continue her studies at Mannes College, the New School for Music. From 2012 to 2014, she attended the International Keyboard Institute & Festival. She has studied piano with Hideo Sugiura, Yuko Ninomiya, Jerome Rose, German Diez, and Musicians Foundation Board Member, Michiyo Morikawa. Ms. Hara has already received numerous competition prizes including: Music Competition for Children, Chunichi newspaper prize, Piano Teachers Association Competition, the Senzoku Conservatory Prize. She was awarded the Bronze Medal(1st in Asia),and the Gold Medal at the International Chopin Piano Competition in ASIA and was a finalist at the Osaka International Music Competition She performed her recital debut in Japan at Munetsugu Hall in 2012 to the highest acclaim. Mrs. Morikawa was born in Japan and began playing the piano at age five. 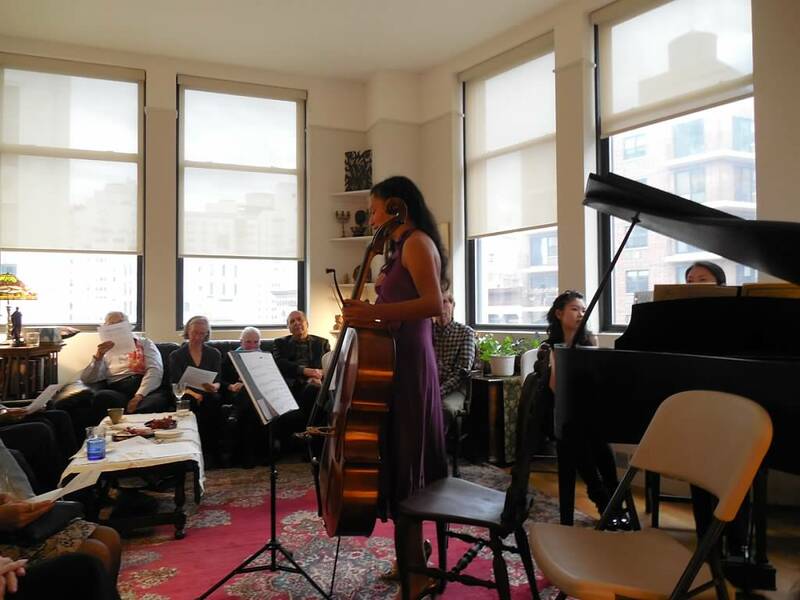 After graduating from the Toho Gakuen School of Music where she studied with Yoriko Takahashi, she attended the Aspen Music Festival studying with Aube Tzerko and John Perry. She holds a Master of Music degree from the Manhattan School of Music where she was under the tutelage of Karl Ulrich Schnabel. She completed her Professional Studies diploma at the Mannes college of Music as a student of Jerome Rose and Hugo Goldenzweig. She continues her musical studies with German Diez. 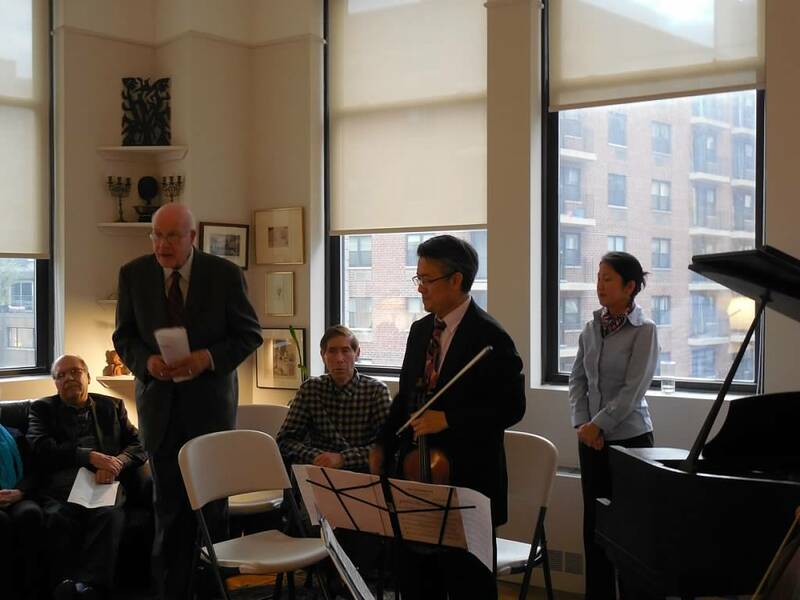 Ms. Morikawa has received significant honors including First Prize and the Special Composer’s Prize at the XII Concurs de Piano “Premi Ciutat de Berga” in Spain; Special Prize “Musica Española” at Ignacio Cervantes piano competition in Havana, Cuba, winner of the Japanese-American Association Piano competition in New York City; The Rockefeller Foundation Grant for the Performing Arts. She has performed as a soloist with, among many others, the New York Symphonic Ensemble, Filarmonica de Jalisco, Orquesta Sinfonica de Michoacan, and Sinfonica de Coyoacan. A frequent recitalist and Chamber player, Ms. Morikawa has performed across the globe, including: New York City’s Weill Recital Hall at Carnegie Hall; Bellagio, Italy (by invitation of the Rockefeller Estates); Spain; Japan; Finland (at the Helsinki Philharmonic Orchestra Chamber Ensemble Concert); and Mexico. 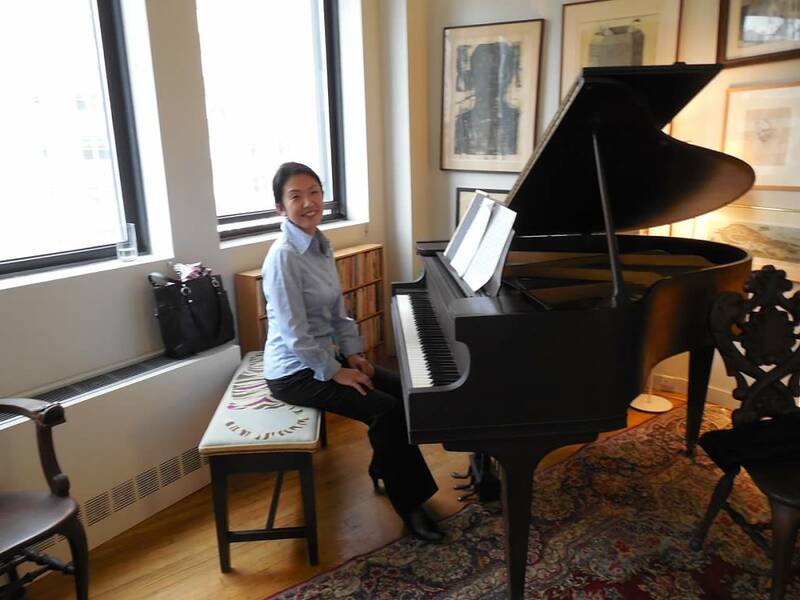 Ms. Morikawa is currently a piano teacher at the Third Street Music School Settlement, and Greenwich House Music School in New York City. Ms. Rocha is an active performer in New York City. She has performed recitals in Beijing, China, the Palacio de Bellas Artes in Mexico City, the Universal Forum of Cultures and the Experiencing Villa-Lobos Festival. Ms. Rocha has also performed as a soloist with the North Valley Chamber Orchestra. She has performed with Camerata New York, National Lyric Opera, Reading Symphony Orchestra, Rhode Island Philharmonic, Miami Symphony and recorded Mi Alma Mexicana with the Philharmonic Orchestra of the Americas, a cd released by Sony that celebrates Mexico’s bicentennial. Nelly has performed in the Late Night Show with David Letterman and participated in the Porgy and Bess 75th Anniversary US tour and the Verbier Festival Orchestra European tour to Milan, Luzern, Berlin and Madrid. One hundred years ago, a group of musical luminaries who were members of The Bohemians — a club that included Arturo Toscanini, Sergei Rachmaninoff, Pablo Casals and Jascha Heifetz — recognized the critical need to provide emergency financial relief to musicians in distress. In doing so, these socially engaged artists helped pioneer the course of charitable giving in this country. Encouraged by the ratification of the 16th Amendment and the Revenue Act of 1913 establishing tax exemption for certain organizations, The Bohemians immediately set about creating the Musicians Foundation. In creating the country’s first nonprofit in support of musicians, these celebrated artists not only made an indelible mark on American culture with their own music, but were prescient enough to protect the future of music created by professional musicians of any genre. Founded on May 8, 1914, the Musicians Foundation has since proven tireless in providing both short- and long-term support to legions of musicians. The organization’s beneficiaries include the legendary late singer Jimmy Scott, jazz pianist Brooks Kerr and Bruce Langhorne — the real-life inspiration for Bob Dylan’s iconic song, “Mr. Tambourine Man.” By ensuring that these artists were able to endure hardships, the Musicians Foundation has enriched all our lives exponentially. In commemoration of this prestigious centennial milestone, the Musicians Foundation has just announced that Wynton Marsalis, Kristen Anderson-Lopez and Bobby Lopez will join the organization’s Advisory Council. Among his numerous achievements, Mr. Marsalis is the recipient of nine Grammy Awards, (he is the first artist to win for both jazz and classical recordings,) and a Pulitzer Prize for Music. He is the first jazz artist ever to have achieved this. Honored throughout the world with many more coveted distinctions, Marsalis currently serves as the Artistic Director for Jazz at Lincoln Center in NYC. Kristen Anderson-Lopez and Bobby Lopez are the celebrated team who wrote the music for Disney’s Frozen, including “Let It Go,” for which they won an Oscar. Additionally, Mr. Lopez co-wrote the music for The Book of Mormon and Avenue Q. He is one of only twelve people who have won an Emmy, Grammy, Oscar and Tony Award, and the only person to win all four within a decade. We are immensely honored to have the invaluable advice and support of such renowned artists who have all made groundbreaking contributions to music. Their extraordinary creative abilities will undoubtedly add new depth to our work. And their commitment to helping fellow artists will provide a game-changing boost to the ways in which the Musicians Foundation impacts the lives of musicians in crisis. We are so pleased to be joining the Musicians Foundation family. For 100 years they have been helping musicians in times of tragedy, crisis and severe adversity. This mission is dear to our hearts. There can be no music without musicians, and we recognize that any one of us could need help at some time. We feel honored to lend support to other artists through this compassionate and honorable organization. In anticipation of the holiday season, when charitable giving is more top-of-mind, it is worth remembering how little support is offered to musicians and music teachers in general, let alone in times of crisis. Lack of viable employment, illness, natural disasters, crime victimization… these can happen to anyone at any time. But there is no such thing as automatic workman’s comp, sick leave or pension plans for most musicians and music teachers. We’re there to help them and their families in emergencies, so they can maintain a sense of dignity and get back to the important work of making music. 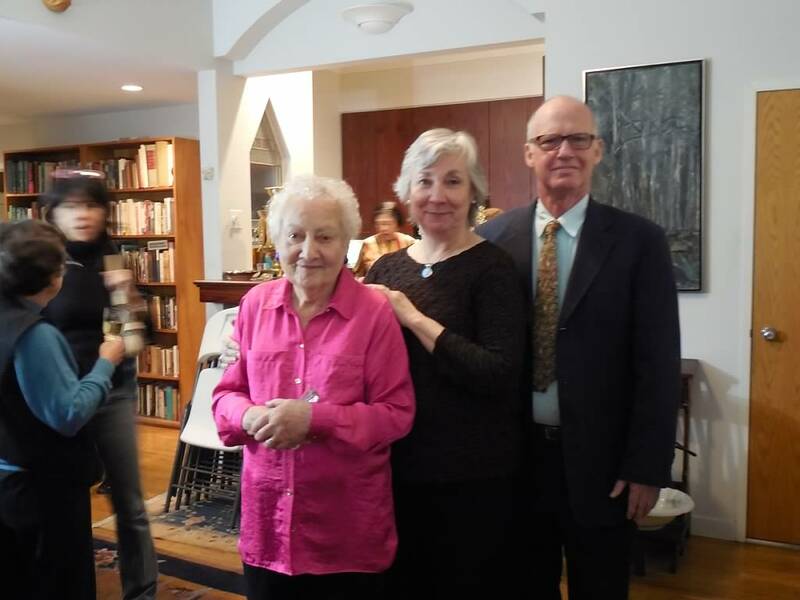 Brooks Kerr, the extraordinary jazz pianist who needed help from the Musicians Foundation during a serious health crisis, said it better than we ever could, “It is not what happens to you in life, rather it is the recovery that really counts.” That is why we work so hard. Because of your love of music, we are sure you will agree that it is imperative to support the people who have so greatly enriched our lives with their music when they are faced with crisis. Help can mean receiving needed care to recover from illness or crime victimization. It can mean assistance in replacing an instrument lost to fire. It can mean the difference between homelessness and a workable future plan, or between having to walk away from music and weathering a storm to continue one’s art. Please help us help those who have given us so much joy. This is the perfect time to support the Musicians Foundation. Our Board of Directors has generously pledged to match the first $20,000 raised by the end of the year dollar for dollar. Your gift will have twice the impact. We are proud of our history as the oldest charity in America supporting musicians — across genres and across the nation. In this, our centennial year, we are making every effort to increase our impact. We would love to hear your ideas about ways in which we might reach an even broader audience — funders, of course, but also musicians who might need our help. Please feel free to contact us with questions and ideas. For more about us or to make an online donation, please see our Donate page, or email B.C. Vermeersch at bc@musiciansfoundation.org or call us at 212.239.9137. P.S. Your donation now will support those who give their artistry so that our world remains full of music and your gift will be matched 100%.